Presenting Jack Thorne's original, Harry Potter and the Cursed Child, the renovated Lyric Theatre is experiencing a spectacular takeover with the realm of J.K. Rowling's multi-book cosmos featuring Harry Potter, Muggles, Mudbloods, and Hogwarts School of Witchcraft and Wizardry. 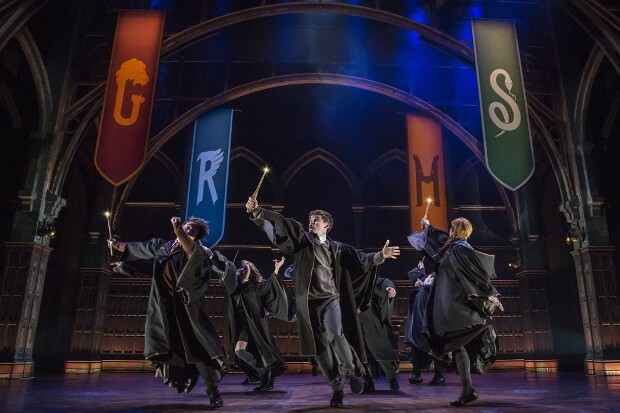 While the theatrical two-part stage continues the Potterworld world of amazement and fantasy, the core of the story comes down to the personal world of family, friendship and maturing presented in two performances. You can choose to see the entire five-and-a-half hour show in one day with dinner break, or in a two-day package. This current production is originated by Thorne although Rowling and director John Tiffany also have their hands on the show. Truthfully, a familiarity with Rowling's Harry Potter seven-book world is the key to how much you will enjoy this ambitious spectacle. Newbies can expect complications following the plot but be assured that the slick, $68 million production values do the trick of electrifying entertainment. John Tiffany (Once) directs the smooth movements by Steven Hoggett (The Curious Incident of the Dog in the Night Time) on sets designed by Christine Jones with Neil Austin's lighting excitement, while the magic and illusions director Jamie Harrison combine to create the wizardry. Since time moves with elasticity in this world, clocks on the stage show time racing forward or backward. Characters may have fingers extending fearfully and the go-to weapons are wands spurting firepower. (Wands are a hot item in the mall-like lobby.) Ghastly figures, "Dementors," descend from the rafters, whirl overhead and grab characters from the stage. Costumes by Katrina Lindsay include wide black hooded capes made for swirling and swooping in graceful fantasy. Back to the story, time has marched on for Potter and the gang. Harry Potter (Jamie Parker) is now a middle-aged, harried employee of the Ministry of Magic. He is married to spirited Ginny (Poppy Miller) and they have three children. We meet them at Kings Cross station where their youngest boy, sensitive Albus (Sam Clammett), is about to board the train for Hogwarts School of Witchcraft and Wizardry. Albus is far from enthusiastic and we come to discover that threading through the story are Albus' long-time struggles with his father over truth and life. Also departing for Hogwarts School are Potter acquaintances, an affable Ron Weasley (Paul Thornley), his tough-minded wife, Hermione Granger (Noma Dumezweni) who is also the Minister of Magic and their daughter, Rose (Susan Heyward). Also at the station is Scorpius (Anthony Boyle), the son of Harry's own school bully, Draco Malloy (Alex Price). Albus and Scorpious, played convincingly by Clammett and the striking Anthony Boyle, become close friends when they start Hogwarts, realizing they are both misfits and through flashbacks and flashforwards, they charge into the sometimes-good-often-horrible school years. Those well-acquainted with the Potter cast of characters cheered at the appearance of Rowling's famous contemptuous Minerva McGonigal (Geraldine Hughes), Albus Dumbledore (Edward James Hyland), and Byron Jennings playing a sarcastic Severus Snape. Jessie Fisher is a stand-out as Delphi Diggery who manipulates her way into many of the devious activities of Albus and Scorpius. No question about it. For budding Potterheads, it is a treat, a plot heavy on adventures, dazzling thrills and quick cuts, but it is also laden with too much repetition and trimming would certainly help. While Cursed Child is one expensive investment, the show will certainly add to the coffers of J.K. Rowling's legendary world of 500 million books sold and multi-billion dollar film earnings worldwide. Be aware though, that all this does not mean that Cursed Child is a guaranteed audience pleaser for every theatergoer.